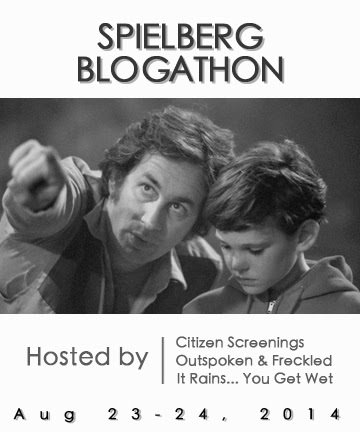 Just announced: It Rains...You Get Wet, Citizen Screenings, and Outspoken and Freckled are hosting a Steven Spielberg blogathon on August 23-24th of this summer! "A prolific filmmaker to be certain. But more importantly, so many of his films became part of our American experience — thanks to his signature style of weaving in very heartfelt and little “real” moments into every film. With so many wonderful Spielberg offerings, why not bid adieu to summer with a SPIELBERG BLOGATHON? While I’ve participated in a number over the years, I’ve not hosted such a blog event. So, Ye Ol’ Blog IT RAINS… YOU GET WET will join the dynamic blogathon duo, Aurora of CITIZEN SCREENINGS aka @CitizenScreen and Kellee of OUTSPOKEN & FRECKLED aka @IrishJayhawk66, in paying homage to this beloved master of cinema with a blockbuster blogathon to end the summer with a BANG!